Get the huge benefits of recognizing your employees as they reach service milestones, and use these special occasions to acknowledge their loyalty, dedication and significant achievements throughout their years of service. See this article for details on this important recognition tool, and how you can easily show your appreciation with a service award. The most powerful and cost effective way to recognize employees for their long service is through a formal Employee Service Award Program. Recognizing employee service milestones by allowing them to select their own gift is a great option for service awards. This is easily done by giving the employee a Service Award Catalog, which is a level based collection of items the employees can select from. 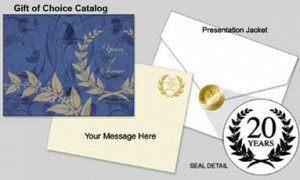 The catalog is included in an award presentation package, and are available at many price levels to fit every recognition budget. Employees select one item, using the catalog - or online, and submits their redemption order. The item is sent directly to the employee, making this a very easy to use solution that can fit every award budget. When starting a new service award program, the issue of what to do about past, unrecognized milestones always occurs. 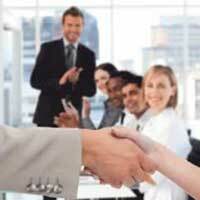 There has to be a date set as an arbitrary starting point for your new employee service awards program. But what should be done for those who have passed previous length of service milestones without any recognition? Here's how to create a positive experience when starting a new Employee Service Recognition Program. 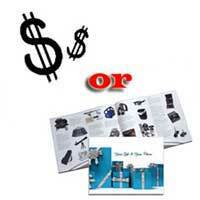 Which are better Awards - Cash or Merchandise ? There is perhaps no subject debated more frequently by employee incentive program managers and their participants, than the question of using cash, or non-cash tangible recognition gifts in any of your employee recognition programs. So, which is better, and why? To get the most out of your Employee Service Awards, try to have the employee’s manager play a key role in presenting the award. Take advantage of these excellent opportunities to highlight the employee's dedicated service and their recent achievements. The service award presentation will demonstrate and reinforce your company’s values. Starting an Employee Service Anniversary Awards program will give management powerful opportunities to recognize and thank employees for their dedicated, loyal service. Studies show that implementing a service award program will have a significant impact by helping to improve employee retention and build employee morale, while demonstrating how much you value your employees.